Our festivals are a time of joy and thanksgiving; a time of mutual appreciation of every member of the school community; a moment of showing gratitude both for the time we’ve been granted together, and anticipation of the gifts of time that lies ahead. We customarily focus on four festivals, as cornerstones of the year. They are Easter, the Festival of St John the Baptist, Michaelmas, and Christmas. These festivals are integral to the rhythm of life in a Waldorf school.The goal is to develop in the child a sense of the rhythm of the seasons and the passage of time and a sense that there is something bigger than himself/herself. Festivals bring the school community together not only in shared purpose but also in the supportive cycles of life. Students sense joy and gratitude in the community around them. They experience a historical continuum, celebrating the earth, humanity, the cosmos, and their connections. This fosters reverence, through acknowledging something greater than oneself, allowing a deep experience of gratitude and harmony. 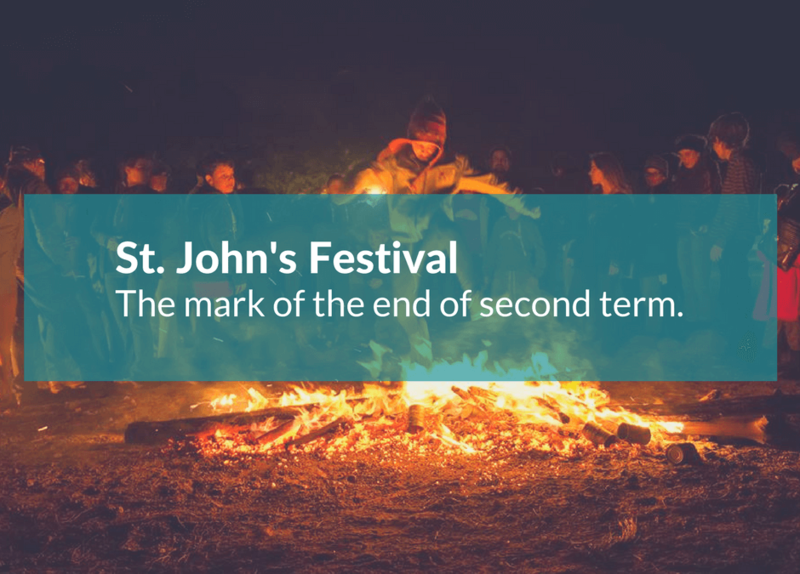 The celebration of St. John’s marks the end of the second term at Roseway Waldorf and the winter solstice in South Africa. The St, John Festival is one of the favorites among those in our school community. It celebrates the fire of the spirit within the human mind and heart. Each child goes on their own journey while making their lantern. You can see the joy and pride in their faces when they come out of their classes into the circle to show everyone else their special lantern. In the Primary School, parents and family are invited to join us on this festival night and it is traditionally celebrated with the whole school community. Preparation for the festival begins in the classes with stories, songs and crafts. The day of the festival is then set as close to the winter solstice as possible. Festival celebrations begin in the evening, with performances by the classes in the primary school. Festival songs are sung with the classes and community after which we make our way to the bonfire area. Children remain with their class teacher to light the lanterns they made in the weeks leading up to the festival, whilst parents proceed to the area around the unlit fire to await the children’s lantern walk, which is a magical and heart-warming sight. Once the primary school are gathered around the unlit fire, the Class 7 torch-bearers speak a ceremonial fire-lighting verse and light the fire. The children remain with their teachers until the fire has burned and fallen after which they may go spend the evening with their families. In our High School, the festival celebration is freshly re- envisaged each year with the goal of capturing the essential motif. The power of the light in each human being can be expressed and shared in many different ways amongst young adults and their teachers. One highlight of the event for both Primary and High School is when the flames die down, students, teachers and parents jump over the ashes of the fire to signify leaving behind past troubles, overcoming our weaknesses and celebrating the strength of the human spirit. Hot, nourishing bowls of soup and fresh bread is served. It is a memory-filled festival for everyone involved. As we head into this time of peace and celebration, we wish our Waldorf families and friends peace, and we look forward to welcoming everyone back safely into the third term.